How to become an ISP via BT? If your business is considering becoming an ISP, we’ll walk you through our capability to facilitate access to all areas of BT Business. The Network Union is ideally placed to provide the skills and knowledge required to help your business set up as an Internet Service Provider. At the core of our approach? We offer BT Wholesale and Indirect services. Unlike many operators in the telecoms channel space, we only focus on BT to ensure we don’t dilute our expertise. We’re a boutique channel operator backed by the logistical capability which only a large telco can provide. In this article, we’ll offer you a couple of options. The first is offers access to BT Wholesale and their associated products. The second is a simpler agency based model where BT pay commission (we share 70% for our Resellers) creating a very simple model to gain access to the BT Business portfolio. A study of our recent applications to the BT Reseller Programme suggests there is a trend toward requests to de-risk the ISP business plan. Where once the primary option revolved around buying high-cost central pipes to aggregate traffic, today there are alternatives enabling businesses to select simpler routes toward the goal of ISP setup. With the above in mind, a simplified capability / service and product set results is access to Wholesale and Indirect services without having to invest in any physical infrastructure. In order to further increase revenues, we’re also able to offer SIP, Cloud Voice, BT Mobile, Hosting, Managed WAN and Point to Point/Multipoint circuits. Setting up as an ISP requires a process, product knowledge and the ability to proactively monitor your base of clients. While other Channel partnerships provide access to multiple ISPs (think Virgin, COLT, TalkTalk) our strategy is ‘all in’ with BT. We work with the typical IT/Telecoms Distributor / Reseller but also any business which sells products and services requiring ISP connectivity. The Network Union is a BT Premier and Wholesale Partner of BT. How to become an ISP via BT Wholesale? Setting up an ISP at the purest level requires investment and an IT Support/Billing capability. However, as we’ve mentioned, the options to sell Internet connectivity via Wholesale today are simplified compared to just a few years back. With any Wholesale relationship, your business will own the contact but whether you also support and bill the client are optional extras offered via our BT ISP programme (your mileage will vary with other providers). Access to BT via Network Union is offered to ensure you are involved as little or as much as your business requires. Where your business is looking to add up to 2000 end Broadband customers, BT Wholesale offers a product called Broadband Complete. The capability includes both 80Mbp/s FTTC (Fibre to the Cabinet), 330Mbp/s FTTP (Fibre to the Premises) and Copper services. In the sub-2000 customer range, the overhead of providing your own infrastructure is essentially removed. In short, the easiest way to sell Broadband ISP services to your customer base. We operate a portal where, via simple process our team can order, add, upgrade and manage your customers' services. With reporting, we also keep you fully informed as to order status with inventory management. In short, the sub-2000 range is typically the most common requirement we see from all applications to our programme. When or if your customer base increases over 2000, we offer access to Wholesale Broadband Managed Connect. Our BT Wholesale portfolio includes Business PSTN lines to support Copper and FTTC access adding further value to your customer base. 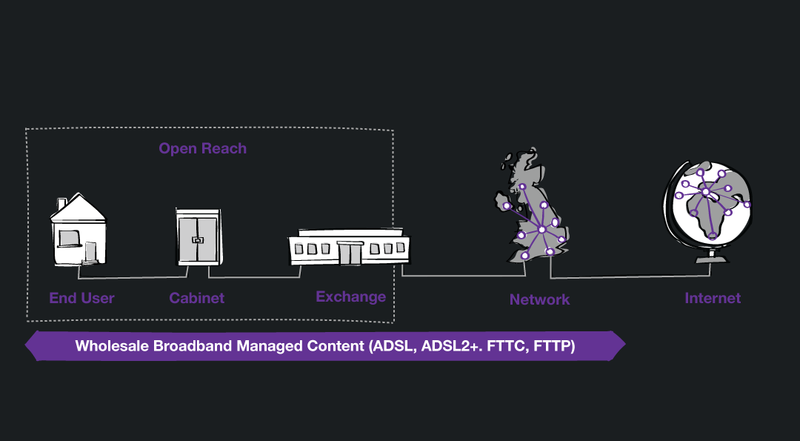 If Ethernet leased line ISP connectivity is required, Internet Connect UK is the BT Wholesale variant of BTNet. Available as 100Mbp/s, 1Gbp/s and 10Gbp/s with managed edged router or wires only. In addition to ISP services, SIP, Cloud Voice and Mobile (based on EE mobile) represent further product options to increase the overall value of the sale and benefits to your client base. How to become an ISP via the BT Partner Programme? The BT Partner Programme is an agency based model - a different proposition to BT Wholesale as the end to end contract, support and billing are all provided by BT. The difference in capability doesn’t end there as the Partner programme only support business to business - with our Wholesale offering, sales are made to both the business and consumer section. Setting up as an ISP via Partner Sales begins with a unique BT generated Reseller code, all orders are placed against your business entity enabling us to track commission, order status and product type. Setting up as an ISP via the Partner Programme means your business is performing the task of selling BT products and services as an agency via a commission based model. In the case of Copper and Fibre broadband, payments are based on an initial up-front amount followed by a small bonus for resigns at the end of the contract (depending on the product). With leased lines, commissions are paid as a percentage up front for each year of the contract together with a lower percentage for resigns. Training - Network Union operate a comprehensive training programme across products for sales, technical and support staff. Billing & Support - Select from a complete ISP model where your business provides all elements from the managed router to billing and support. Or, a hybrid version with only the elements you require, we have the capability to support and bill your customers. Meeting resources - if your opportunity is large enough, Network Union and BT will offer to attend meetings and conference calls. Reviews - we discuss new product releases, technical elements and general account management.